Healthy teeth can be moved at any age, so there's no such thing as being too old for braces. However, orthodontic treatment for adults is different in two important respects: For one thing, the growth and development of the jaws is complete in adults, so changes in jaw structure and shape can't be accomplished in the same way as with a growing child. 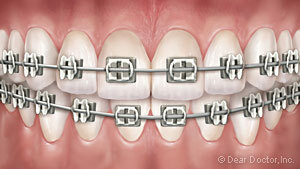 Traditional Metal Braces — This is probably what you think of when you picture someone wearing braces: small metal brackets bonded to the front of the teeth. 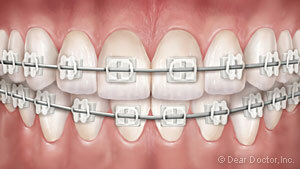 A thin wire runs through the brackets and applies pressure to the teeth. 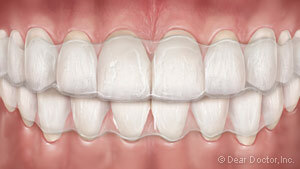 Clear Braces — Instead of metal brackets, you can have clear ones made of ceramic. They are hardly visible, except for the thin wire running through them. Invisalign® — As an alternative to the fixed type of orthodontic appliances mentioned above, clear aligners are removable. They are actually a series of clear plastic “trays” that fit over your teeth precisely, moving your teeth a little bit at a time until they are in proper postition. Your aligners are designed with the help of specialized computer software that generates a virtual model of your teeth and bite. Wearing a retainer after orthodontic treatment is crucial, no matter which type of appliance you choose and what age you happen to be. Teeth that are not held in place by a retainer long enough for new supporting bone to develop around them can drift back to their original positions, and that's certainly not something we, or you, want to see happen. We will make sure to instruct you on how to retain your new, beautiful smile so that it continues to make you look and feel great for years to come.